Pressure cooking involves preparing food in an air tight container. The word pressure cooker has emerged from the concept that the food is prepared in the vessel under heavy pressure. The vessel is filled with water as required along with all the ingredients required for preparing the particular dish. The vessel is then heated and thus steam is formed within it. It remains trapped and increases the temperature by 40 degrees approx, and thus the food is prepared at a faster rate. The cooking time reduces by 2/3rd if compared to the traditional means of cooking. The great advantage of the pressure cooking approach is that it enhances the taste of the food to a great extent by retaining the nutrients and the natural flavour of it. It is not necessary that one need to add a lot of liquid to the food in order to pressure cook it. It is enough to put as much water as required. The mechanism of the vessel is such that it captures the moisture from the food through the process of cooking and that is used for cooking the food. The pressure cooker manufacturers are thus putting forth newer models of cookers to cope up with the increasing demand for the essential cookware. It is best to use stainless steel pressure cooker as for aluminium cooker although the metal being a good conductor of heat but the metal also tend to release a part of it in the food, which give rise to a major health concern. Stainless steel doesn’t put forward such an issue and hence it is the better. Stainless steel on the other hand is non porous, stable, never gets pitted by the process of cooking, does not warp, does not react to food having acidic property, can be kept clean at all time and there is no end to the advantages extended by it. Last but not the least the stainless steel cookers tend to last for at least 20 years and that’s why a great bargain indeed. 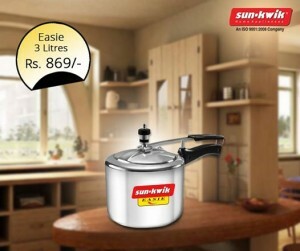 There are several trusted pressure cooker manufacturers offering an extensive range of cookers made of stainless steel. These all-clad vessels envelop aluminum or copper in the base, thereby gaining the benefit of excellent heat conductivity while avoiding the downside of metals leaching into the food being cooked. Clad models will have a heavier base and cost more than all aluminum pressure cooker however, the benefits are notable and a pressure cooker can pay for itself (at 2011 energy rates) in less than one year. Being that stainless steel pressure cooking vessels tend to last an average of 20 years and are both a health conscious choice and a real bargain for the consumer, there is little reason not to get cooking right now. Why pressure cookers are the must-haves for any kitchen? The entire concept of pressure cooking deals with utilisation the liquid vapour and the steam formed inside the cooking vessel for cooking tastier and healthier food. 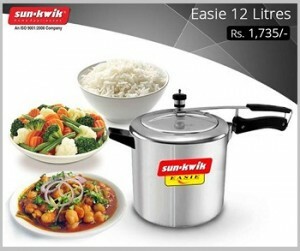 The pressure cooker is thus a cookware powered with specialized mechanism towards utilisation of the mentioned elements. They help in faster cooking and make the entire ordeal easy and effective for the cook. The pressure cooker manufacturers are constantly working to make the mechanism more advanced and enhance the advantages to be derived from the cookware. The basic mechanism stands on the factor that while cooking the vessel works at a pressure pre set and the vapour formed inside not getting any opening to escape. The cooking is always done with the aid of water that boils and simultaneously increases the temperature inside rise to a specific temperature. The contemporary range of devised by the pressure cooker manufacturer tends to cook a dish in minutes which normally would have taken hours to be cooked. The better would be the quality of the cooker faster it will boil the water inside and the temperature of the vapour will rise at a faster rate without affecting the food inside and the situation outside much. Thus the food will be cooked quickly and tastier. The cookers are available now in various sizes and with different developed features. Hence, the users can choose anyone depending on their specific family needs. Earlier, it was the practice to have pressure cookers of larger dimensions so that the temperature of the steam rises fast but now with the emergence of advanced mechanism the temperature can be changed easily according to the requirement of the user. Especial attention is also given by the pressure cooker manufacturers on the safety features of the cooker, so that the cook feels safe and sound while cooking. 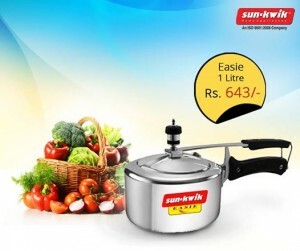 It is wise to have stainless steel pressure cookers as they are more durable; however there is also the choice of having aluminium pressure cooker, which are more affordable selections.